In G.I. 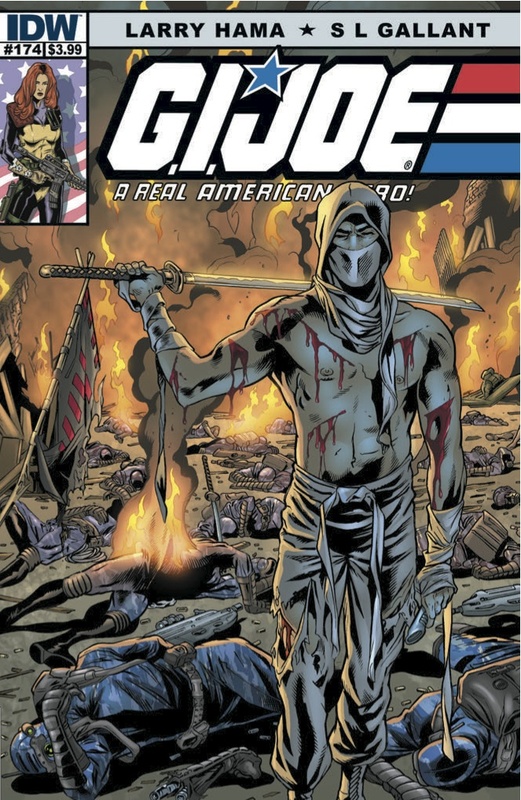 Joe: A Real American Hero #174 (written by Larry Hama with art by S. L. Gallant), the Joes and the former Oktober Guard face overwhelming odds in Benzheen while the both the Joe ninjas and Cobra Commander investigate deeper into the secrets of the Blue Ninjas. An action-orientated issue, this story focuses mainly on the Joes' and the Guards' hit-and-run tactics in defending a small city in Benzheen against countless HISS tanks. Action-packed and fast-paced, the plot moved quicker than I anticipated. There are parts that were hard to believe, such as our heroes coming out unscathed against all those HISS tanks. The retreat of the second wave of HISSes and MAGGOTs timed too well, although the betrayal of the citizens afterwards was a great touch. Still, it was refreshing to have a story focus on secondary characters such as Steeler, Cover Girl, Cross-Country, and Wildcard, as well as the former Guards. The relationship between the Commander and Billy has always been complicated and conflicting. The Commander had young Billy imprisoned when he's first introduced, is nearly assassinated by him, but then gives up his life with Cobra when he finds Billy maimed. Not much later, he leaves Billy for dead on Cobra Island, and then scrambles his mind with the brainwave scanner. It is the time period between the assassination attempt and his brief resignation that is my favorite Commander, because it was then we learn that, behind the mask of this powerful, brilliant, larger-than-life leader is truly a man with a past, a family, and a soul (albeit heavily corrupted). This made him so much more interesting as an antagonist. After his resurrection and return to Cobra, the Commander became almost a caricatureof himself, having lost all signs of his humanity, and becoming a one-dimensional villain. With his discovery of Billy's death last issue, and his preparation of the funeral this issue, Hama seems to be returning to that pre-resignation Commander and depicting him as a deeply complicated human once again. I fully welcome this return. S. L. Gallant once again does a strong job with his clean style and his painstakingly close attention to classic figure and vehicle designs (couldn't Mindbender wear a suit to the funeral instead of his trademark bare torso and cape?). The art was solid from beginning to end, although I would like to point out that the last panel in the funeral scene is absolutely stunning. The HISS tank just may be my favorite vehicle, and seeing the different versions of them battling in Benzheen (and the drivers arguing for seniority based on whose was most advanced) was a nice touch. A quick-moving, action-packed comic which sets the stage for more to come. Highly recommended.